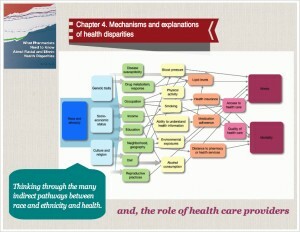 When we think about the most frequent interactions in pharmacy practice – filling and dispensing prescriptions – it isn’t immediately obvious how racial and ethnic disparities might manifest themselves, or how the pharmacy can affect health disparities. Research about such disparities in pharmacy practice is in its early stages, and we are just beginning to learn about ways in which these disparities might occur. 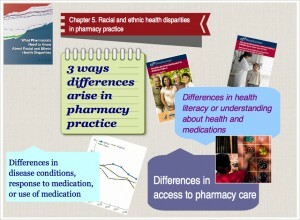 infographic for Chapter 5, which highlights the three ways racial and ethnic health disparities may arise in pharmacy practice. Advances in genomics and pharmacogenomics have provided information about the genetic distribution of traits linked to disease and to drug metabolism. Pharmacists working with different populations may encounter different prevalences of certain conditions, as well as differences in patient responses to specific medications. Racial and ethnic groups vary in their understanding about their health and the medications prescribed for them. This variation may result from differences in education, language limitations, or cultural issues. The issue of access to care encompasses a broad range of factors, including access to health insurance, income, coverage by Medicare and other insurers. It also encompasses broader definitions of access. 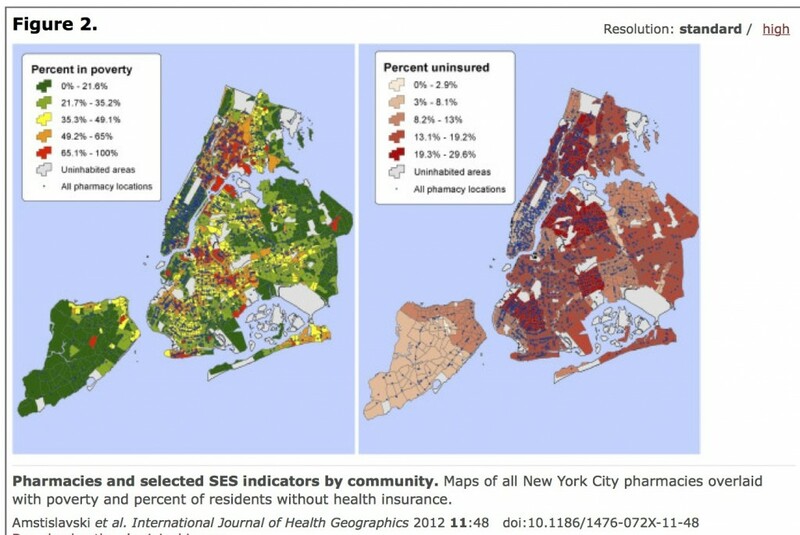 Geography and transportation limit people’s ability to access many types of services, including pharmacies. If a person doesn’t live near a pharmacy or has no access to transportation, their access is limited. Similarly, if the pharmacy in their neighborhood does not stock what they need, their access to the care they need is limited. 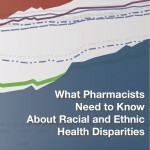 More about the role of pharmacists in eliminating racial and ethnic health disparities in the book, “What Pharmacists Need to Know About Racial and Ethnic Health Disparities”.